From modern skyscrapers to landmark buildings, see Chicago's architecture by adding these top highlights to your itinerary. What do the Chicago Water Tower, Wrigley Building, Merchandise Mart, Willis Tower, Trump Tower, 875 N Michigan (formerly the John Hancock Center), Marina Towers, and the Aqua building have in common? They are all some of Chicago&apos;s truly unique architectural wonders. Use the guide below to mix-and-match from various eras and areas to build your own Chicago architecture itinerary. Or go the easy route and let the pros lead you on an architectural tour. Either way, make sure your camera battery is fully charged — your lens is about to get a workout. An architectural achievement, the skyscraper designed by the renowned firm Skidmore, Owings & Merrill rises to a height to 1,450 feet. See breathtaking, 360-degree views of Chicago from the Western Hemisphere&apos;s tallest building on its observatory Skydeck Chicago and experience The Ledge. On the National Register of Historic Places and a Chicago Landmark, the picturesque Rookery was designed by famed architectural partners Burnham and Root. Built during a transition period in architectural construction, it uses both load-bearing masonry and a skeletal frame-distinguishing elements of the Chicago School of Architecture. Frank Lloyd Wright redesigned the two-story skylight lobby in 1905-1907. The last of the great masonry skyscrapers, its solid block form conveys strength and sturdiness, though it is actually comprised of two narrow, connected office towers. The earlier northern half completed in 1891 is the heaviest and tallest wall-bearing structure in Chicago, supported by curved base walls that are an impressive six feet thick. Its architects Burnham & Root insisted on vertical simplicity and it is famed for its absence of ornamentation. The south addition is an early example of steel-frame construction. A harmonious combination, they mark the end of one architectural tradition and the transition into a new one. 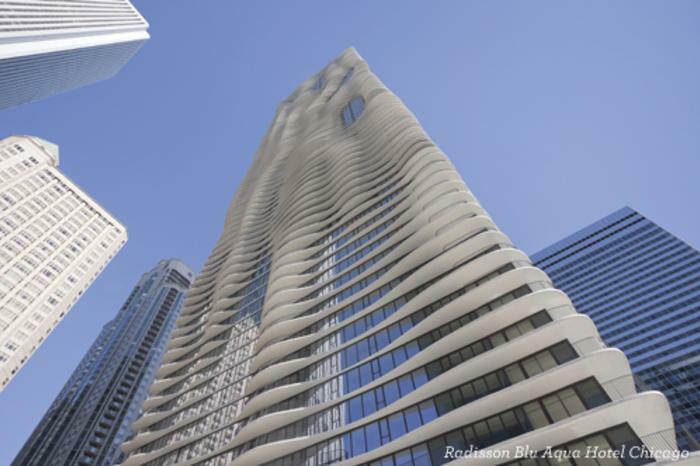 Located near the shores of Lake Michigan, this water-inspired tower is no standard skyscraper - it&apos;s more like outdoor sculpture. This shimmering multi-use high rise by "genius grant" MacArthur Fellowship winner Jeanne Gang connects strongly to the outdoors and the city, with outdoor terraces that give it its distinctive undulating appearance. One of the most iconic buildings of the city&apos;s skyline, 875 N Michigan – with its gutsy, masculine design in the tradition of industrial Chicago – offers a stunning view 1,000 feet up from the award-winning 360 CHICAGO (formerly the John Hancock Observatory). Additionally, The Signature Room at the 95th and The Signature Lounge at the 96th both offer terrific views of the city while you enjoy food and drinks. For over 75 years, the Wrigley Building has been recognized as one of Chicago&apos;s most attractive buildings. Its dazzling white terra-cotta cladding, well-proportioned architecture and nighttime lighting have established it as a symbol of Chicago in many books, films and television programs. This splendid building is an unforgettable site, day or night. A Chicago Tribune competition in 1922 spurred a flood of international entries all vying to create "the most beautiful and distinctive office building in the world" for the newspaper&apos;s new headquarters. The design by the New York firm headed by John Mead Howells and Raymond Hood was selected out of over 250 concepts and today their Neo-Gothic limestone tower — complete with elegant buttresses, beautifully carved stonework and an octagonal campanile — forms a grand gateway to the Magnificent Mile. This diminutive limestone tower stands proud in a cityscape of sleek glass and steel architecture. As one of the few buildings to survive 1871 Great Chicago Fire, it is a beloved symbol of Chicago&apos;s enduring spirit. Resembling a miniature medieval castle, the Gothic-style structure was built in 1869 by William W. Boyington and is part of the Old Chicago Water Tower District, which includes the Chicago Avenue Pumping Station and a Fire Station built in 1904. 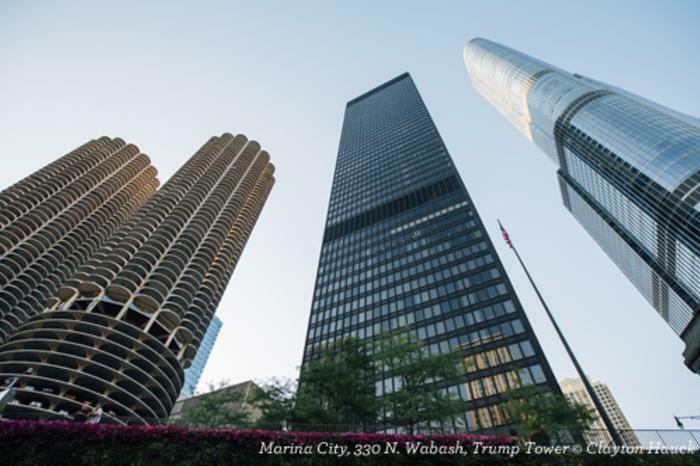 Designed by the great Chicago architect Bertrand Goldberg, these riverside twin "corn cobs" fascinated Chicago and the world when it opened in 1962. At that time, the mixed-used complex was the tallest residential building and tallest concrete structure in the world. The 92-story condo/hotel tower is Chicago&apos;s second-tallest building, with a height of 1,398 feet including its needle-like spire, and was designed by acclaimed firm Skidmore, Owings & Merrill (who also brought Chicago the Inland Steel Building, Willis Tower and the 875 N Michigan Center). The gleaming glass, steel and concrete structure rises prominently from its base at an oblique angle along the Chicago River&apos;s curve, though a series of three setbacks are level with the height of its surrounding neighbors and provide visual context within the skyline. Developed by a master of the modernist movement, Ludwig Mies van der Rohe, this straightforward, rectangular monolith was the last American office building he designed. Steel and glass combine in shades of black and gray to form an archetypal example of the "Miesian" skyscraper and his aesthetic: minimalist, exact, symmetrical, functional... an ethos famously summed down to "less is more." Its raw, structural beauty is undeniable, much like his other famed Chicago works like 860-880 N. Lake Shore Drive and Crown Hall on IIT Campus. Encompassing 4.2 million square feet, it&apos;s the world&apos;s largest commercial building, largest wholesale design center, and one of Chicago&apos;s premier international business locations. The massive space hosts many trade shows and events, and public areas include the Luxe Home kitchen and bath showrooms, retail shops, and The Chopping Block, a local cooking school offering classes for individuals and groups. The great 20th century architect&apos;s personal residence and workplace during the first 20 years of his career was his architectural laboratory and is considered his first masterpiece. Here in Oak Park, Illinois, he and his associates developed a new American architecture, the Prairie style. One of Wright&apos;s most significant early works, his first – and perhaps greatest — public commission is a study of space, volume and light. An unadorned concrete exterior contrasts against the open and airy inner chamber. Inside the "jewel box," as he called it, a sense of movement is always at the forefront, flowing from the angles and corners of the square ground plan. Designed by Frank Lloyd Wright, this residence is a masterpiece of the Prairie style and an icon of modern architecture. Always conscious of the relationship between light and space, his innovative home design features long, low horizontal lines — most notably seen from its signature roof — as well as natural materials, an open floor plan and a strong connection to its exterior landscape. What better place to start than on a Chicago Architecture Center tour? With 85, walking, bus, and boat tours available, you have plenty of choices. You should definitely try to catch their popular River Cruise boat tours on Chicago&apos;s First Lady during the summer season – the official boat tour company for the Chicago Architecture Center. Other skyline tours by boat can be had aboard Chicago Line Cruises, Shoreline Sightseeing, and Wendella Sightseeing Boats. All offer great views and great stories of Chicago&apos;s iconic skyscrapers. Of course, your feet can show you the sights as well. Explore top highlights and off-the-path gems from inside and out with Chicago Detours. Highly-trained guides will spark your imagination using iPads loaded with archival images like maps, historic photos and documentary video clips. 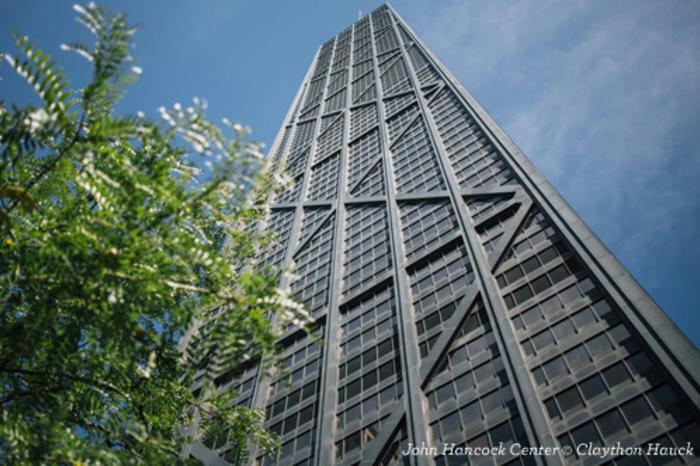 Get up close and personal to the city&apos;s architectural gems with Inside Chicago Walking Tours. Rather than just look at the facade of the great buildings, your guide will have you touching century-old walls, lead you through grand train stations, and take you back in time with lobbies that evoke the Roaring 1920s. Then there is the Chicago&apos;s Finest River Walk Tour, which highlights – you guessed it – the Chicago River and its icons. Finally, if you want to explore on your own terms, try Metrowalkz Self-Guided Walking Tours. For less than $12, you can download all sorts of audio tours including one on Loop Architecture. Another budget option: Free Tours by Foot. No other architect has had quite the mark on the Chicago area as Frank Lloyd Wright. 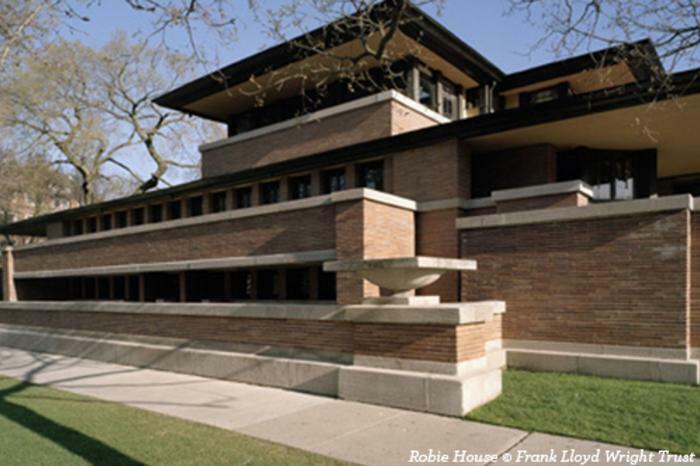 The Frank Lloyd Wright Trust offers tours of the Rookery Building downtown, the Robie House in the Hyde Park neighborhood, the Bach House in the Rogers Park area (seasonally), and Wright&apos;s home and studio as well as Unity Temple in the nearby suburb of Oak Park. You can easily access Oak Park via the CTA "L" train. Please note: Some of the above tours are available seasonally and are weather dependent. Please check with each tour company for availability.